We went to the State Fair two weeks ago with Katy's grandparents. We had a great time. Katy rode the pony and the carousel. We also tried the skyride. She seemed to like it although her mom was very scared. Katy was pretty alarmed when she saw her grandparents; she was probably worried that she might spend another week in Reno again. Even though she has been saying she "wuv" Grandma all week long, when the grandparents were here, she stayed far away from them. Many times, she would tell her mom that she wanted to go to "Katy's house, no Grandma's." I guess it will be a while before we can send her there again. We went back to the fair last Friday. The weather was fabulous. It was cool and breezy, very unusual in Sacramento in August. 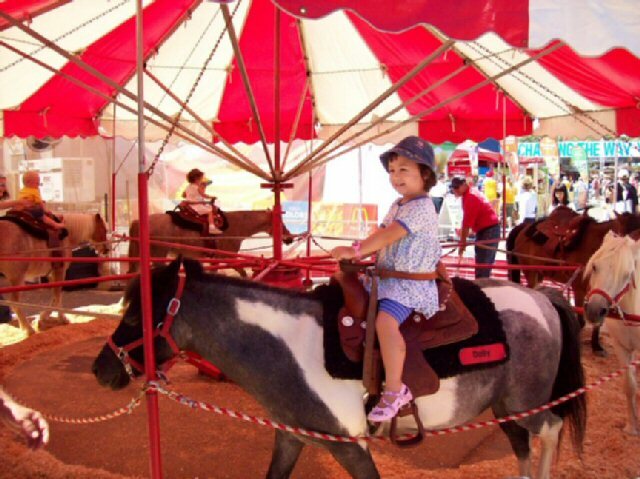 When we told Katy we were going to the fair, she was so happy and said she wanted Dolly horsey. She remembered the pony's name. Of course she rode the same pony again. And the carousel. She also tried a couple of other rides and loved them. I think she is ready for Disneyland. We stayed pretty late. By the time we got home, Katy said she wanted to sleep. She was one exhausted and happy girl. It was really nice to be able to spend time together as a family. Katy's daddy is taking a break this semester, so that is a treat.